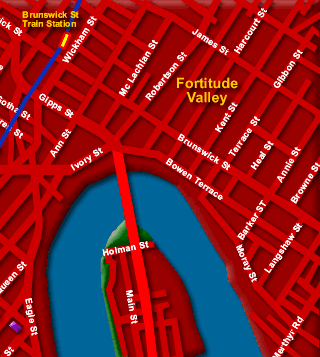 Find Alphabetically: location of Brisbane Tourist Attractions Brisbane Tourist Attractions by Name. See the Australia Map page for more. You can find other Australian cities including Melbourne Victoria, Surfers Paradise Queensland and Perth in Western Australia. On display at the Queensland Museum: Mephisto - the only surviving German tank from World War 1 - captured by the Australians. A life-sized reconstruction of a Tyrannosaurus rex and a Triceratops. As well, there is a science centre, a whale mall and an endangered species section. 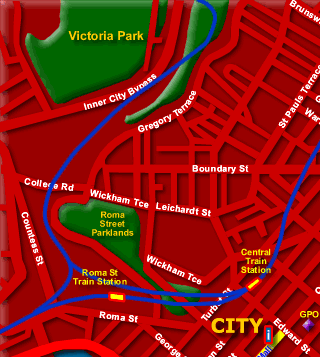 Open 9:30 am to 5:00 pm, seven days a week except Good Friday, Christmas Day & ANZAC day morning. 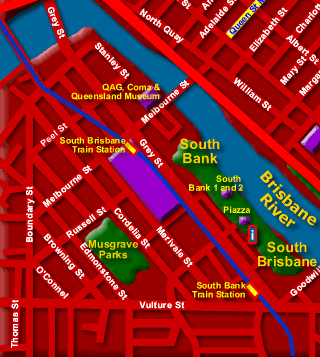 See Location of the Queensland Museum in South Brisbane Brisbane City Map. 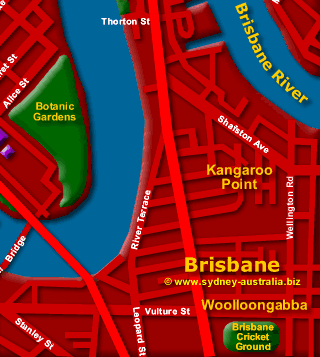 Main Photo: Click on Brisbane Area to Zoom for Attractions or see this map with hotels Brisbane Hotels Map.